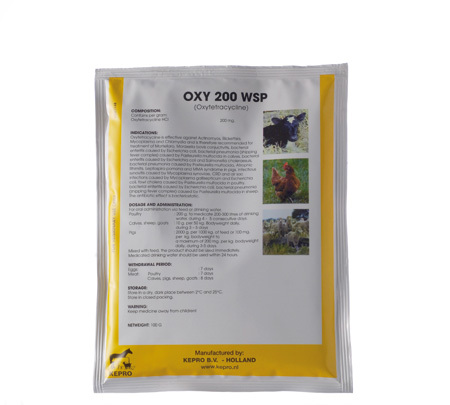 Oxytetracycline is a broad-spectrum antibiotic, effective against a large number of Gram-positive and Gram-negative bacteria (except Pseudomonas, Klebsiella and Proteus spp.). 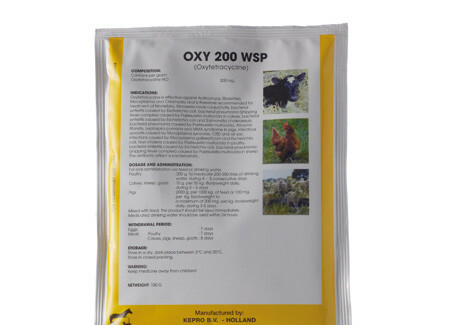 Oxy 200 wsp is effective against Actinomyces, Rickettsia, Mycoplasma and Chlamydia and is therefore recommended for treatment of Mortellaro, Moraxella bovis conjunctivitis in calves, Atrophic Rhinitis and MMA syndrome in pigs, Pasteurella multocida and Mycoplasma infections in poultry. The antibiotic effect is bacteriostatic. After long-term treatment, complications may occur due to vitamin B and vitamin K deficiencies, which are caused by disturbances in the microbiological digestion. Do not combine with other antibiotics like penicillin and cephalosporin. Poultry : 200 g per 200 – 300 litres of drinking water during 4 – 5 days. Calves : 200 mg per kg bodyweight daily, during 3 – 5 days. bodyweight daily, during 3 – 5 days. High concentrations of Iron, Copper and Calcium in the water can result in formation of coagulation complexes.